The way to get to an up-to-date landscape description of an SAP system landscape is via the data suppliers of its technical systems’ sending data to the System Landscape Directory (SLD). 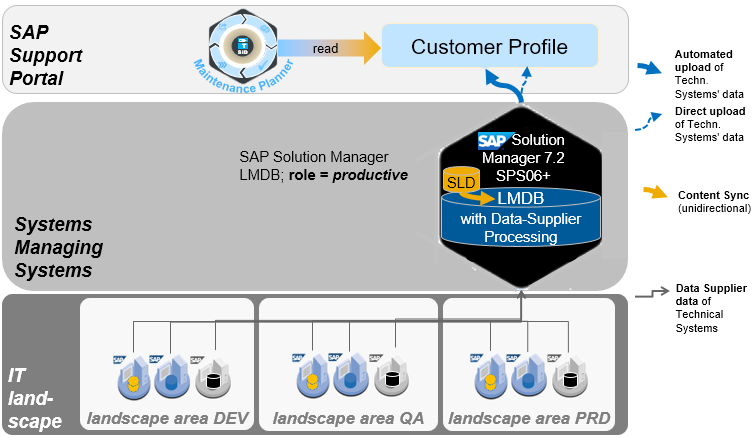 Now, as an addition to this option, there is a new one: As of SAP Solution Manager 7.2 SPS06, the Landscape Management Database (LMDB) can act as a target of data suppliers of technical systems. The LMDB has learned how to process data supplier data like the SLD in addition to processing the agents’ data. However, compared to SLD, there is neither forwarding of landscape data available, nor can the LMDB act as a source for a full, automatic synchronization. Therefore, with SAP Solution Manager 7.2 SPS06, this feature can be used in a restricted number of scenarios. Figure 1: The LMDB acting as data supplier target in a landscape with no SLD client applications. Note that the SLD system in SAP Solution Manager is required to upload the CIM model/CR_Content to the LMDB. This option is recommendable, if there is no need to have an SLD system as a data supplier for the LMDB. You could reduce its use to providing CIM model/CR_Content only. The SLD is only required to be up and running while CIM model or CR content are updated, and it does not need to be monitored during normal operation. LMDB functions have extended to accepting and processing data supplier data. It can act as the original data supplier target now.